The C-146A Wolfhound is a tactical transport aircraft designed for the US Air Force. The C-146A Wolfhound is the military version of Dornier 328 airliner. Image courtesy of Luc Willems. C-146A Wolfhound is powered by two Pratt and Whitney turboprop 119C engines. C-146A Wolfhound is a tactical transport aircraft designed and manufactured by Fairchild Dornier, for the US Air Force (USAF). The aircraft provides flexible, responsive and operational transportation of the US Special Operations Command (USSOCOM) personnel in the theatre. The aircraft is also used to conduct non-standard aviation (NSAv) missions to assist Joint Special Operations Command of the USSOCOM. It is deployed with the 524th Special Operations Squadron of the Air Force Special Operations Command (AFSOC) at Cannon Air Force Base to conduct infiltration, exfiltration, cargo resupply, airlift and other military missions in prepared and semi-prepared airfields across the globe. The airlift aircraft began operations with the USAF in June 2011 and entered into service with the US Africa Command (AFRICOM) to assist Overseas Contingency Operations in October 2011. It is also deployed with four Geographic Combatant Commands. The C-12 Huron is a military version of an executive passenger and transport aircraft based on the Beech Model 200 Super King Air. The C-146A Wolfhound is the military version of Dornier 328 airliner designed and built by Fairchild Dornier. 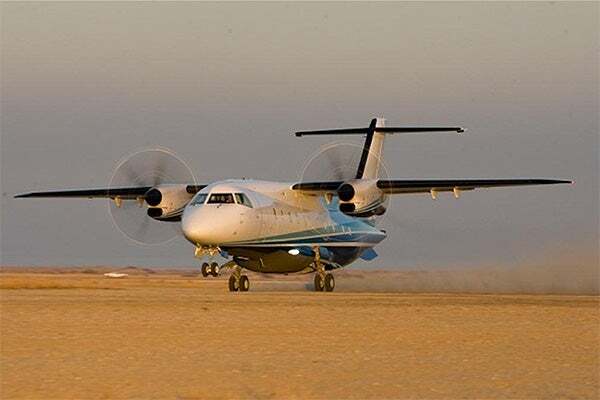 Sierra Nevada Corporation was contracted to provide design, modification, integration, modernisation, test and certification for conversion of 17 Dornier 328 airliners for use by the US Military. Germany-based 328 Group was awarded a four-year contract worth more than $200m to deliver spare parts and logistics support for the conversion in 2009. The 328 Group bought 15 of the aircraft from different sources, including those in Europe, America and Africa, while the remaining two were directly acquired by Sierra Nevada. The 328 Group delivered the 17th and final Dornier 328 turboprop in July 2013 to Sierra Nevada. The C-146A Wolfhound transport aircraft can be configured to execute multiple missions including casualty evacuation (CASEVAC) and can carry up to four litter patients. The aircraft has a length of 20.98m, height of 7.24m and wing span of 21.11m. The maximum take-off weight is 30,843lb. The aircraft can carry up to 27 passengers, while its flight deck accommodates two pilots and a loadmaster. The flight deck and cargo cabin areas are specially configured with night vision goggle (NVG) devices to capture images in low-light conditions. The C-146A Wolfhound is equipped with Primus 2000 avionics systems manufactured by Honeywell Aerospace. The avionics include electronic flight instrument system (EFIS), engine-indicating and crew-alerting system (EICAS), and five cathode ray tube displays measuring 7in x 8in. The aircraft is also fitted with flight management system, a dual Primus II integrated radio system, dual integrated avionics computer, automatic flight control system, dual digital air data reference unit, dual altitude and heading reference system, Primus 650 weather radar, mode S transponder, fault recording, traffic alert, and collision avoidance system (TCAS 2000). A ground proximity warning system (EGPWS) is also fitted. "The aircraft can carry up to 27 passengers, while its flight deck accommodates two pilots and a loadmaster." The aircraft can be optionally fitted with Allied-Signal GTCP 36-150 auxiliary power unit, ground spoiler, Primus 870 weather radar, global positioning system with non-precision approach, an additional mode S transponder, an enhanced EGPWS, HF, CAT II approach, electronic flight bag, and LED lights. The C-146A military transport aircraft is powered by two Pratt and Whitney turboprop 119C engines, each producing a power of 2,180shp. The propulsion system includes two-spool, two-stage centrifugal compressors, two-stage power turbine, reverse flow combustor and electronic engine control. The engine is also equipped with off-set reduction gearbox. The maximum speed of the C-146A Wolfhound is 620km/h, the range is 1,800nm with a cargo load of 2,000lb, and the service ceiling is 31,000ft.